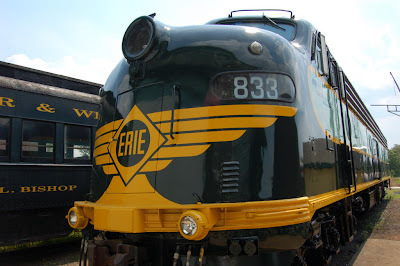 The recently restored Erie E8 #833 along with other former Erie RR equipment will be on display in Port Jervis, NY this weekend, 8/28 and 8/29, as part of the Port Jervis Centennial Celebration. 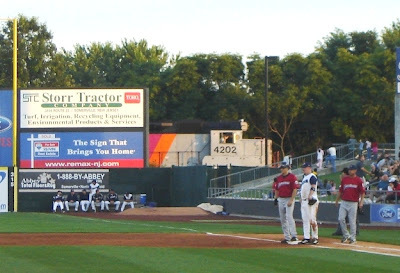 It will probably be located somewhere in the vicinity of the train station. 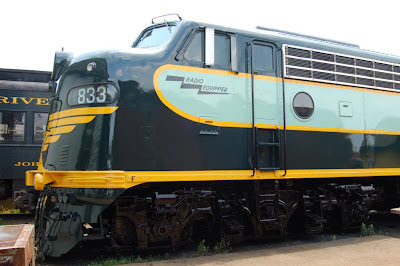 The 833 was restored in Ringoes, NJ by Star Trak, Inc., and will be moved to Port Jervis some time this week. 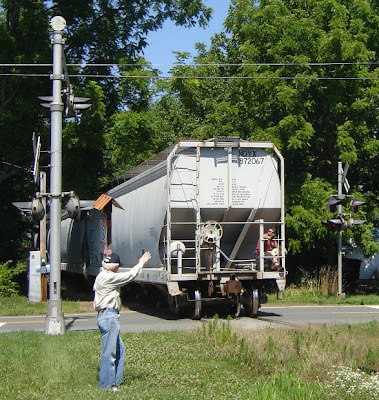 It must be inspected by NS first, and then it will be picked up from the Black River & Western RR at their interchange with NS in Three Bridges. From there to Port Jervis, but I don't know the route. Hopefully not by way of Conway yard. 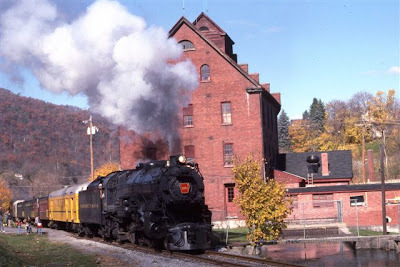 "The 833 is supposed to move out this Sunday to the familiar territory of Port Jervis. 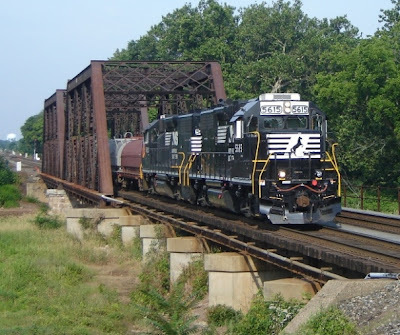 1267, 935, the Chestnut Hill and Pride of the Delaware will all be moving east out of Lackawaxen to PO sometime next week. The Erie RR celebrated PO's 50th anniversary by displaying it's modern equipment, well, 50 yrs later it's back (see Erie RR mag Oct., 1957) . You're all invited to dejavu all over again next weekend in PO. 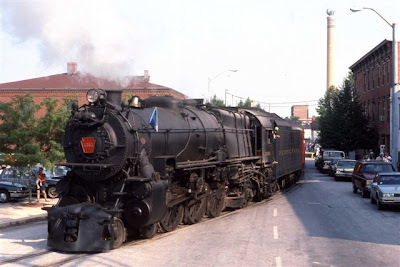 The EL dining car society will be hosting open house on NYGL equipment on Sat and Sun, July 28 & 29th with a store & refreshments set up on one of the cars." Here are some pictures and text from Star Trak, Inc.'s web site. 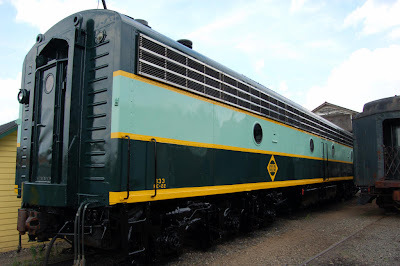 "Star Trak has recently completed a full exterior restoration of Erie E8 #833. This included the removal of exterior fiberglass panels, repair of structural members, rust mitigation, re-assembly, sheet metal and body surface preparation, and paint. 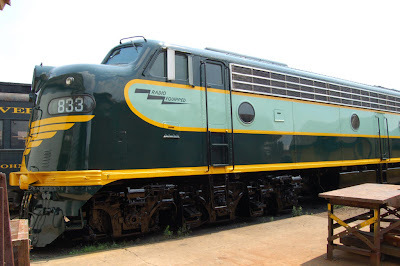 This unit is truly unique in that it was the last E8 built for the Erie Railroad as well as the last known surviving unit of it's kind assigned to the Erie." Received the following email from Kermit Geary, Jr. The photos and captions are his. It's probably apropos that this news would come on Friday the 13th: the K4s#1361 restoration project is reportedly dead. Awful glad I made the effort to go and photograph her when she actually ran!!!! Two years and two months later, we were able to get together for a day of rail fanning. The first train spotted was an eastbound NS intermodal, symbol unknown, at West Portal around 8 AM. NS 19G (Oak Island, NJ to Pittsburgh, PA) was holding the siding at CP 67 until this train passed and would then be on its way west. A little while later at Pattenburg, another NS eastbound intermodal loaded with COFCs was seen, possibly 24V. After talking about the tunnel’s history, we drove over to Lansdowne Junction. I showed him what remained of the LVRR's roadbed to Pittstown and explained about the history associated with that spur. The sound of NS 18G (Pittsburgh, PA to Oak Island, NJ) approaching would be reason enough to momentarily halt our conversation and watch it pass by. Motive power was PRR 8378 (C40-8W, ex-CR 6159) and NS 9882 (C40-9W) bringing this load of mixed freight east. Next stop would be Three Bridges to see if NS was running any trains through here. The signal at MP 48 was green over red but no NS trains would be seen. Black River & Western was busy though, switching cars for NS H76’s Sunday pickup and we went over there to watch them work. For both of us, seeing BR&W 8159 (SW1200, ex-CP 8159) still wearing the CP paint scheme was a nice surprise. The final stop of the day would be Manville. CSX Q300 (Philadelphia, PA to Oak Island, NJ), led by CSX 7533 (C40-8) and an unidentified second unit, would finish working Manville yard and head east with fifty-eight cars at 12:35. A little while later, CSX Q438 (Hamlet, NC to Selkirk, NY), with CSX 5335 (ES44AC) leading a second unidentified diesel and seventy-five cars of mixed freight would head east. While there were lulls seeing trains, there never was a lull when it came to talking about them. Bill would reminiscence about trips on Amtrak, his favorite railroads such as the D&amp;H, Bangor & Aroostook and CSX. 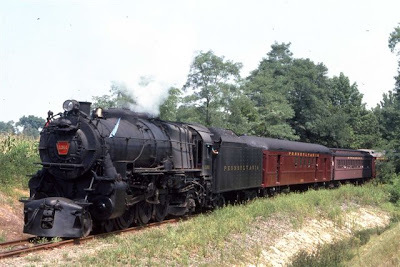 I would counter with my historical knowledge of the Lehigh Line, trips to Shenandoah Jct. and Kingman (AZ). As you can imagine our conversation covered a variety of railroading, non-railroading topics and geography. Could not have asked for any better weather than what we had on this Saturday. Seeing at least one train at each stop was a bonus. At day’s end, this all added up to an enjoyable day to be trackside. Hope your day was just as nice. Received the following via email from Kermit Geary, Jr. These are his photos. Hi All: It is never too early ...or late to offer a bit of rail safety advice! ALWAYS LOOK AT THE RAIL BEFORE WORKING AROUND IT WHEN TESTING IN MOUNTAINOUS TERRAIN !!!! !Found this friendly critter along the Delaware River today...testing the Central New York's line from Lordsville, NY to Susquehanna, PA. Should finish off tomorrow in Binghamton and then head North to Syracuse, NY...From there onwards to the RBMN! Additional email comments from Nathan S. Clark, Jr.
Well, it sometimes CAN be too late to offer the advice, like when you're telling it to some poor bloke who is staring down at the two blood-red pinholes in his hand! Nice, healthy timber rattler specimen. Armed and dangerous. I'd guess a female, based on size. Just trying to get warm in the morning. She(?) will soon be off to look for rodents. You leave it alone and it will leave you alone, etc. 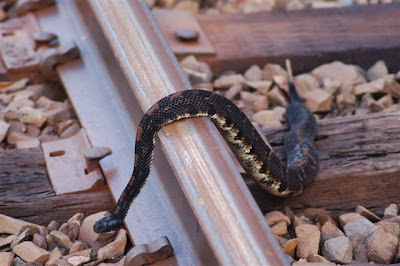 When changing out rail, track crews in snake country do a 'snake patrol' first, so no one goes to the hospital. 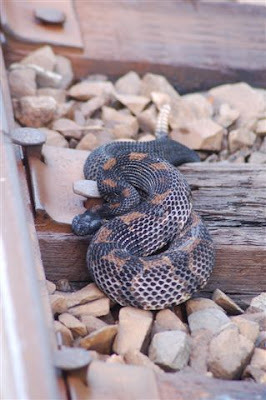 Copperheads, unfortunately, are more inclined to stay put, and also blend in with rusty rail bases better. Photo and caption from The Altoona Mirror. Donald (bottom left) and Corey Jones of New Jersey try on Gary Clare’s (right) conductor hat. Jordan (second from right) and his father, Steve, traveled with the family from New Jersey for RailFest and the excursion around the Horseshoe Curve. To view more photos, visit cu.altoonamirror.com and click on the We CU tab. 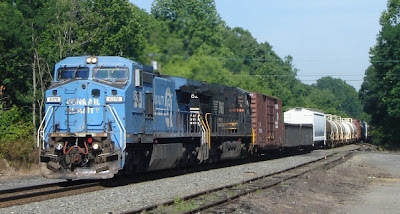 7:05- NS Intermodal, unknown symbol, had NS 9643 (C40-9W) and NS 2729 (SD70M-2) as its power. NS 64R was holding on the passing siding at CP Bound Brook before getting its orders to proceed down the Port Reading Secondary at 7:34. 7:45- NS 11J's power consist of NS 7640 (ES40DC) and NS 9793 (C40-9W) would have fifty-four autoracks in tow. 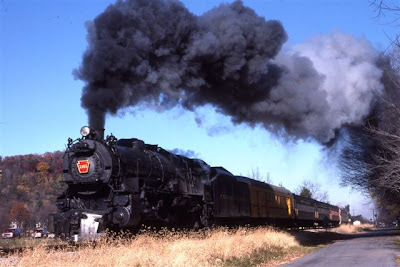 8:00- NS 21M's power consisted of NS 9786 (C40-9W), NS 2670 (SD70M-2) and NS 9907 (C40-9W). 8:25- MA-1 would have two GP38-2s, NS 5615 (ex-SOU 2828) and NS 5620 (ex-SOU 2871), bringing seven coil cars east. 8:45- NS 24V power's would be NS 9812 (C40-9W) and NS 7609 (ES40DC). 9:35- NS, unknown symbol, would have NS 7511 (ES40DC) and NS 9237 (C40-9W) bringing three empty autoracks east. 10:03- CSX Q300 finished working the Manville yard and would head east on the passing siding and hold CP Bound Brook to wait on a westbound NS train. The first ten cars were garbage container cars (PU!) followed by sixty-six cars of mixed freight. 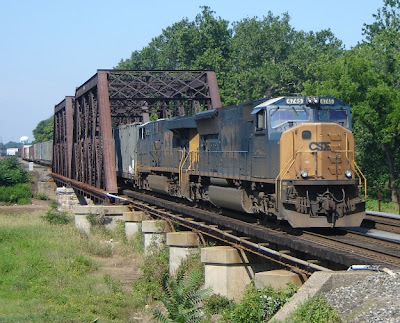 Motive power was CSX 4745 (SD70MAC) and CSX 5347 (ES44DC).